The Oracle Academy offers four hybrid computer science educator professional development courses that introduce concepts of database programming and the Java programming language. Each course takes about 10-12 weeks (90-180 instructional hours) to complete and is facilitated by an Oracle instructor who interacts with participants throughout the process. At the end of the series, participants attend a two- or three-day face-to-face event to conduct their final project and pass certifying exams to become certified to offer high school level courses. Java Fundamentals provides an introduction to object-oriented programming concepts, terminology and syntax as well as the steps required to create basic Java programs using the Alice, Greenfoot and Eclipse interactive development environments. Java Programming provides an introduction to the core application programming interfaces used to design object-oriented applications with Java. Database Design and Programming with SQL engages students in analyzing complex business scenarios and creating a data model, or conceptual representation, of an organization’s information. Programming with PL/SQL introduces PL/SQL, Oracle’s procedural extension language for SQL, and the Oracle relational database. The Oracle Academy received the ISTE Seal of Alignment for Mastery. Reviewers determined that this resource promotes mastery in the ISTE Standards for Computer Science Educators. The Oracle Academy offers five professional development courses for teachers who wish to become certified to teach corresponding high school level computer science courses. The five-course series includes Database Design, Database Programming with SQL, Database Programming with PL/SQL, Java Fundamentals and Java Programming. The program focuses primarily on teaching basic programming languages and skills necessary for the design and construction of databases. Within each course, participants have access to high-quality, detailed, multi-media instructional materials that are both well organized and visually appealing. Participants also have opportunities to practice and implement their newly acquired skills in real-world settings while benefiting from expert feedback and instruction. 1.a.i. Effectively use primitive data types. 1.a.ii. Demonstrate an understanding of static and dynamic data structures. 1.a.iii. Effectively use, manipulate and explain various external data stores: various types (text, images, sound, etc.) various locations (local, server, cloud), etc. 1.a.iv. Effectively use modeling and simulation to solve real world problems. 1.b. Effectively design, develop and test algorithms. 1.b.i. Using a modern, high-level programming language, construct correctly functioning programs involving simple and structured data types; compound Boolean expressions; and sequential, conditional and iterative control structures. 1.b.ii. Design and test algorithms and programming solutions to problems in different contexts (textual, numeric, graphic, etc.) using advanced data structures. 1.b.iii. Analyze algorithms by considering complexity, efficiency, aesthetics and correctness. 1.b.iv. Demonstrate knowledge of two or more programming paradigms. 1.b.v. Effectively use two or more development environments. 1.b. vi. Demonstrate knowledge of varied software development models and project management strategies. 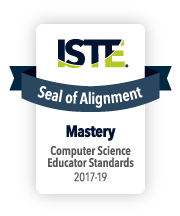 This program incorporates ISTE Standards-aligned learning objectives, specified implementation plans and embedded tools for measuring mastery in the ISTE Standards for Computer Science Educators.